Scottish First Minister Sturgeon to seek independence referendum in late 2018. 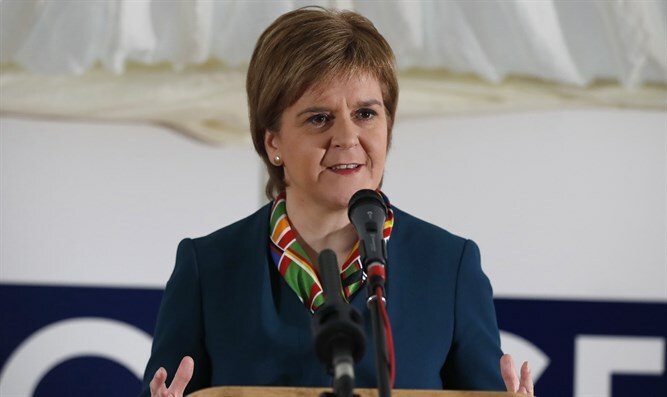 Scottish First Minister and Scottish National Party Head Nicola Sturgeon on Monday announced she will seek another referendum on independence from the UK as early as 2018. "I can confirm today next week I will seek authority of scottish [sic] parl -legislate for an independence referendum," Sturgeon tweeted early Monday afternoon. Sturgeon said the British government had put up a "brick wall of intransigence" in everything related to its "Brexit" withdrawal from the EU. She also said the vote indicated a "material change in circumstances" since Scottish voters last rejected independence in 2014. By late 2018 or early 2019, she said, the details of Brexit will become clear and voters will be able to make an informed choice over whether they wish to remain part of the EU or not. "The future of the UK looks very different today than it did two years ago," she told reporters. "Scots should be able to choose whether to follow the UK to a hard Brexit, or to become an independent country able to secure a real partnership of equals with the rest of the UK and our own relationship with Europe." She also stressed the importance of being "frank about the challenges we face and clear about the opportunities independence will give us to secure our relationship with Europe, build a stronger and more sustainable economy and create a fairer society." "Membership of the single market was ruled out with no prior consultation with the rest of the UK. We face a future outside the world's biggest single market." It is not clear if the Britain's ruling Conservative party, which is firmly opposed to independence, would veto her bid. British Prime Minister Theresa May has not yet said whether she would grant Scotland independence.